I am absolutely floored to look at my calendar for December. I just told my kids if they don't have a wish list for Christmas prepared in two days, Santa will not be prepared by the 25th! Besides our very own Christmas party on the 6th and Christmas shopping for the kids at Emanuel Hospital, I have scattered medical appointments, eye surgery on the 16th, and another medical procedure, next week! Sheesh! I don't know how I'm going to do this! Lately, I take more walks on the river without a fishing rod, than with. 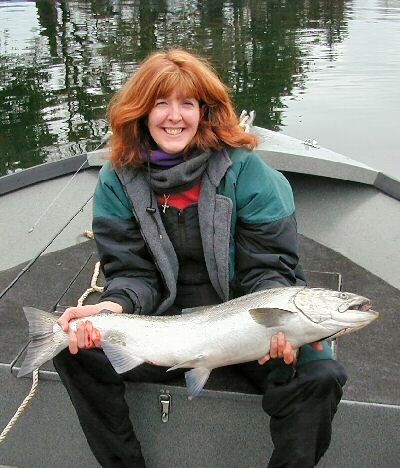 I don't have faith that there are many steelhead in, and I'm growing weary of salmon. Besides, they are spawning, and I hate to take the chance of disturbing them out back. Don't get me wrong. There will be fresh salmon coming in until January, but you just have to sort through them. My shoulder doesn't much like that option, so I can't wait for steelhead! Steelhead fishing is much easier on me than salmon. Lighter gear, lighter fish! My dog, Kilchis, is highly trained, you know. I've spent countless hours with him in discipline. One of his many talents is salmon spotting. Kilchis has so much fun spotting dead salmon in the water. I ask him, "Kilchis? Fish?!?" He has learned which back eddies they are most likely to settle in. I praise him for "fishing" and he gets all waggly tailed about it. I'm certain he thinks that finding a dead one more often than I find live ones, makes him the better fisherman! Lucky for me he doesn't usually roll in them. He just points them out to me and acts like "What a fine dog am I." I know. All you folks out there work hard to keep your dog from digging in the yard. Living on the Kilchis river, we have banks of dirt to spare, and if I reach down, and excitedly say, "Kilchis, dig dig!" He again gets all waggly tailed and digs to his heart's content. I hover over him and praise him. "Oh, Kilchis, what a marvelous dog! What a beautiful dig-dig! Ohhhhh, Kilchis! Good dog!" "Can Mommy dig-dig?" I reach down to join him, and he growls! This is Kilchis's dig-dig and I am NOT welcome! Kilchis is much like a small child, and I'm enjoying his company. Come time to really concentrate on steelhead, I am sure to get a scolding from Bill. The banks of the river look like a torture track. "Watch your step!" I'll shout. Kilchis's "dig digs" are dangerous to the bank angler's footing. I just hope we have a high water before Bill decides it's time to go. Bill just doesn't have much appreciation for a well trained digging dog. With it will come a clean slate of riverbank. Both for Bill's fishing, and for Kilchis's talented tricks. ...and you just wait! Bill will be pleased when he finds out that Kilchis can point fish! Stan Fagerstrom's last column on Silver Lake is up. I'm sorry to say that Stan is moving from Oregon to Arizona. I'll miss how close he once was, but I'm wishing him many, many sunshiny days on the lakes, there! Please be patient with me! I won't answer e mail or private messages for a bit. I am leaving for Portland to a biz meeting, and then the docs. If I don't get out of the doc appt. in time to drive home before dark, then I have to stay overnight in Portland. It's five in the morning... the power was out for three hours last night as we all froze. I had a terrible dry cough all night, that just wouldn't quit. Ah... A day off, at home. Thank God for Pete, who drove me to downtown Portland, yesterday. I get so stressed out driving in Portland that I almost refuse. The trip across the hill is enough for my eyes! By the time I reached Mcdonalds in North Plains, I was exhausted. We went to visit the home of the ifish server. It is in a secured room with so many others! Blinking red lights light up like an electric fireplace! The power of it all amazes me. They have tape drives that hold up to a terabyte! That's as close to infinity as I can imagine! I've always wanted my own T1... but how 'bout taking a tour of Opus Interactive's connection ability, by clicking here? Now these folks have secured power! I was like a kid in a candy store! "The data center is fed by both fiber optics and standard copper. Two telcos provide separate fiber entrances to the building. They have two OC3 cabinets allowing for 311.04 Mbps of available bandwidth over their optical SONET ring metro networks. We can provide circuits up to DS3 into the data center for cross connection to customer equipment." I put an ifish decal by my rack, and they took a picture of it. I can't wait to have them send it to me. I'll post it here. I'm proud of it! Their offices are so cool! On Friday, the employees take turns bringing breakfast. A full spread of Noah's bagels and cream cheeses of all sorts were laid out for nibbling. The building is one of those I've always dreamed of living in, if I were a city dweller. You see spaces such as these often, in the movies. It was a huge open expanse. An old warehouse, furnished with trendy new furniture. Office cubicles were divided by pretty folding wall panels. The whole space was warm, roomy, and inviting. If you cleared it all out, there would be plenty of space to play frisbee with Kilchis! We could be happy, there!! Yawn. I'm so tired of doctors... He was very nice, but... I was so hoping for a one hour visit where he just fixed the problem! Give me a miracle, Doc! I'm going to relax, today. Maybe make it to Freddies for a little Christmas shopping. It's going to be tough this year, trying to get all things done by my surgery date, December 16th. But, in a way that will be great! Then I can just kick back and recover until Christmas Day! I hope you have a great day! I'm off. I had this idea that the "Christmas for Kids" Christmas party at Pietro's was an easy, no frills get together with nearly no planning. It was! It was that way! Really! At one time! My garage has a newly created center isle for "party planning." Pete has organized volunteers for both the "meet and greet" table, and for hauling the toys to the hospital. I, of course, got confused by email offers of help, and private message offers of help, on the board. Therefore, I failed to include some members in the tally of volunteers. Argh! I'm so sorry! I am going to make this party organized, now, so that I may enjoy the company at the party, once it begins. I'm going to sit down, and enjoy Pizza and my friends. I also hope to be able to be a part of the group that delivers the toys to the hospital. In years past, I have gotten too tired by that time of night, and have excused myself, early. This year I'm going to plan a nap, mid day, so that I might... just might be able to make it to the end! I've heard it's the most joyous time of the event, and I need that kind of energy! After this Christmas party, I will have (count them!) ten days to complete my own children's Christmas shopping, so that I can have my surgery on the 16th, and be well by Christmas day. Either that, or I'll again "just go fishing" and perhaps give everyone salmon for Christmas. Wouldn't my kids just love that? I don't think so! Steelhead prediction: I think it's going to flood by Friday, looking at the forecast. Get your Christmas shopping done this week! By week after this, we are going to be into the steel! The Kilchis is very low and clear right now. Almost worthless fishing, unless you like to hook old darkies. There may be a shot, depending on if we drop in between systems or if we catch a good day that is slightly on the rise. But my best bet is week after next... say Tuesday? May I quit ifish, now? I'm exhausted. Or, at least, a day off. At every stage of the day, I kept thinking, "OK, now the hard part is done, I will now enjoy myself and relax. That didn't happen at noon. It didn't happen at dinner time. It didn't happen as the freight truck took off for the hospital. It finally happened in the emergency room. Tears of sheer exhaustion and final accomplishment overwhelmed me. ..and guess what? I didn't forget anything! Only thing I had trouble with was remembering names, monikers and faces of so many giving people! Alright, so I'm strange. I just don't know how to choose my emotions when I see all the dead salmon in the river, and laying half eaten and mutilated on the rocky shores. I find myself staring, trying to figure out how I feel. Some are pointed up, statue like, laying in the sticks in the shallows. It's haunting. But--It's simply amazing! All the way from Alaska? What a trip! Flocks of seagull, accompanied by an occasional eagle, soar up river once a year for their own style of Thanksgiving. I never know if it's the egg before the chicken or the chicken before the egg. Every year they show up, though, seemingly knowing it is time for the feast. Do they follow the salmon upriver visually, or do they come before, seasonally knowing that it's time for heavy feeding? Maybe I'm nuts. For some reason, I keep thinking of the bible verse that says, "He died so that we could have everlasting life." I know it doesn't really work, there, but I just keep hearing that. The whole experience is spiritual to me. A cosmic mixture of joy, sadness, curiosity, amazement and fear. Yes, death of any kind rings a hollow fear in me. But, it all comes full circle, and the realization of the good it brings balances out... and it settles alright with me. Yesterday afternoon I walked beside the river, and a haunting calm before the storm was present. A darkness fell over the water, and everything turned black and stormy and threatening. The wind swirled the currents backwards. I couldn't see a single salmon carcass through the darkness of the storm cast and ruffled waters. This had been my last shot at witnessing the bulk of dead salmon that would feed the rivers this year. They are left there, I believe, as a kind of haunting reminder that won't let go. Spirits of the river, of the forest, forever. Their memories, hanging from the bushes in oddly colored strips sometimes, even as the rush of fresh steelhead arrive and breathe new life into my daily walks on the Kilchis river. It's beginning to look a lot like Christmas! Even around here! It's mostly not of my doing. It's like magic! I don't know how to begin to thank people that have helped us during this awkward time. I even have Christmas cookies! Well, things are not quite the same this time around, and man oh man, am I having trouble adjusting. I have learned to pray to God on a constant basis. He has again become my closest and most relied on friend and companion. I am learning to walk again. Both as a dependent daughter of Christ, and as a human being, physically making my way from room to room! At times, it is so difficult, and I have so little energy, that I've found myself literally crying and crawling to get back somewhere. My plan to immediately and ceaselessly visit the river has not come true. In fact, it wasn't until yesterday that I even made it to visit the river. And no, I could not walk there. In fact, it was late in the afternoon, and my energy had nearly vanished for the day. Yet, my disappointment in putting this trip off drove me to accomplish my wish. "Hello river." I sobbed, as waves of tears poured from my eyes and the sound of the river song welcomed me home. This river is going to heal me. That's what I heard peep out from the around the tops of the trees, and from under the smallest new agate that peered between my weak and shaky foothold. Bill picked up my chair as I walked 6 feet and asked him to now set the chair, "here." I had trouble controlling the flow of tears, but you know what? I didn't care. Let them flow like the river.... I figure I bought and paid for each one of those tear drops, and it's all part of the healing process to use them, to feel things, and to acknowledge each and every way there is to feel, whether sorry, grateful, sad, lost, scared... let me tell you, I've felt them all. By the time we made it back into the garage, I had trouble with numbness in my feet, and I was unable to make it back into the house. I literally crawled up the back steps, and found my way to a kitchen chair. Now, that's embarassing and humbling! Kilchis thought it was darn funny, though! As I sat, though, and poured through thoughts of my visit to the river, I know I'd not put that trip off again, today. Of all of the feelings I felt, as I realized the river would come to heal me, the one that left me the most impressed was how darn glad I am to be alive. Yes, life is a pain right now, and it's tough, often disappointing, and very tiring. But, I'm going to make it, and I'm darn glad. O.K., so I've been through a lot. Alright, so I was "under the knife" for 12 hours. I know, I know... My body is healing. They used a tile cutter to cut me apart. My heart was outside my body. I know this and more... that neither you nor I wanted to know, I'm certain! Still, I'm very frustrated that I can't walk very well. Very, very frustrated. I mean, I can walk. I just have literally no sustaining energy. Once around the kitchen. Once from the kitchen to the office. I sit down and it hurts so bad from exhaustion that I want to cry. I do think this is the feeling Jane Fonda describes in her exercise videos, regarding, "Make it burn!" Oh, Baby! It burns! I do not think this, however, is the duration of time she expects before it happens, and neither do I! I sit in my upstairs bedroom and stare down at the river. Sometimes a boat will be anchored mid stream. Sometimes I see a heron. Rarely, an eagle. You have no idea the strong, loving connection I feel, here. I want to be there. I don't want to just watch. I want to touch, feel, breathe, walk, experience, get my feet wet-my hands cold, BE THERE. I will. With the desire and the passion for it to happen, this strong, it's sure to happen, soon. I'll tell you all about what happened that fateful day, as well as I can recall. It's all a bit of a blur to me, so I'll have to write or call different onlookers, friends and family to fill in the times and dates more fully. It will be nice to make full sense of where two weeks have gone. I remember getting my hair done that day. I remember fishing, afterwards. I didn't catch anything, I don't think. I don't think I did anything very strenuous. It was then that it happened. Pain shot across my jaw, so absolutely unmistakably that I had no doubt what was going on with me. Within 2 minutes, I said, "Bill, call 911." His response of course, because it was so out of the blue, "What?" "Yes, please call 911." I was very calm. More so than I ever thought to be. I knew what was happening. I remember having Bill call the kids upstairs as I lay on the bed. I remember telling them I loved them, and that all would be OK. I knew that aortic dissections are most often not lived through, so I told them how much I loved them, etc. I was very, very calm. I remember that. LOL. Later, I asked Andrew if he really thought I was sick. "I thought you were being dramatic." You know, I can see how he'd think that! I would have wondered, myself. But yes, I really was that sick, and to this day, the surgeons still have to look at me and say, "Jennie, this really happened to you, big time." My aorta burst, and it burst all the way down. The surgeons replaced the aortic root, ascending aorta, the arch and the top portion of the descending aorta. which were the most immediately life threatening parts of my dissection. He said at the time that they did as much as they could do, as much as he's ever done on a Marfan syndrome patient. Part of his concern was that the coronary bypass have good blood flow, where they put in the graft from your leg. I'll tell you more, next time. I have to do some questioning about times and places. Until then, I remain fixed on the picture outside my window. The river. The river that will heal me.... If I could only get close enough to feel it's magic. I have never prayed harder for physical strength, and if you'd like to join me, I'd be more than thankful. Last night on television I was watching a moth work it's way out of a cocoon. They stated that they could open the hole in the tip of the cocoon for the moth to escape more easily, but if they did, the moth would not be strong enough to make it on it's own in the world. So, here I sit, tediously and routinely trying to work my way out of this burdensome (and seemingly very heavy!) cocoon. It hurts to try and get out, but I bite my tongue against the pain, and continue my "progress." What progress? I keep asking Bill, the boys, anyone around me. "Am I different from two days ago? How? Are you sure? "Oh, yes, Mom. When you first got home, you'd walk 5 feet, and then sit down to sob that it hurt." Now you walk twice as far, and don't whimper as much! You can make it up the stairs, and now you only rest at the top for 5 minutes. When you first came home, you'd nearly take a nap at the top! Who said, "No pain, no gain?" I'm thinking that this is what this is all about. So, yesterday I was out for pain. As the pain hit, instead of giving in to it, I clenched my teeth, and walked past it. I walked past it to water just one more plant, or to feed the kitties their cat food. I tried to do "helpful things." Oh, my, but it's difficult for the Mother of the flock not to be helpful! As I walked, I kept reciting, "still walking, still walking, still....." and breathed through it. It worked! However, today, I think I'm paying for that! My doctor said to me yesterday, "Jennie, as surgeries go, one being simple, and ten being extreme, you had a 10 plus. Be gentle with yourself." When I went to my surgeon the other day, I complained of the 'numb cold feet thing' and told him about my fevers, and he said, "Jennie, you tried to die on us on the table that night. We will work on your problems, but right now, let's just be happy that we have a girl with cold numb feet to work on." You know, I remember times weaving in and out of anesthesia during the surgery, or after, when I thought and felt, "This isn't worth it. This is too hard." Plain and simple, I wanted to die. But, I remember the surgeons and nurses saying, "Jennie! I know this is hard, but this is the hard part! It's easier from here on in!" They cheered me. I'm glad they did. I have a goal for today, or tomorrow. I'm not sure which. yet. It depends on if I feel I should rest today, or push forward. It depends on my reserve of energy. I want to be recharged and rested for this one. "It is well, it is well with my soul. Bill has brought out the portable duck seat. It's very, very light. I'm not going to wear hip boots, or boots at all. They are much too heavy. I'm going to put on light, well worn tennis shoes. I am going to swing the duck chair over my shoulder ever so gently, and I am going to point myself in the direction of.... the river! This way, I can rest when I am tired! If I make it down to the river in 8 hours, I'll still make it, and OH! what reward there will be in that! I will not take a rod. I will take a camera, maybe, just to prove to you all that I can make it. ...and if I can not make it, I will not be upset. I simply have a goal, now, and someday, I will be able to make it! I'm excited. I think I'll take a shower, and try this. I don't care if I make it 10 feet and tucker out. I love having something to work towards! What a reward! The river! Yikes! It's almost too good to be true! You know that when I get there, the water levels will be on the rise. There's going to be some tears of joy coming out of this girl's eyes!